!! !For the month of November the city is doing construction on the facade of our building. So please be aware that there will a metal fence infront of the building and some construction during the day, and our air-conditioning won't be working!!! The Babushka Grand hostel is in the city center, 3 blocks from the train station, 1 block from the #5 tram, which ends in Arcadia on one side and the other at the central bus station. We are one block from the best Restaurant/bar/club venue in the city and are surrounded by many others. We are also 2 blocks from the Privoz market where you can get fresh cheap food directly from the local villages. For your security we have a CCTV camera on the street to buzz in our guests and free lockers to store your valuables so you can rest comfortably. All our mattresses are comfortable box spring mattresses; our sheets are quality cotton and ironed for your sleeping enjoyment. We are experts at finding a reason to party, there is always someone going to a bar, concert or club and during the day we offer unique and interesting tours (see below). 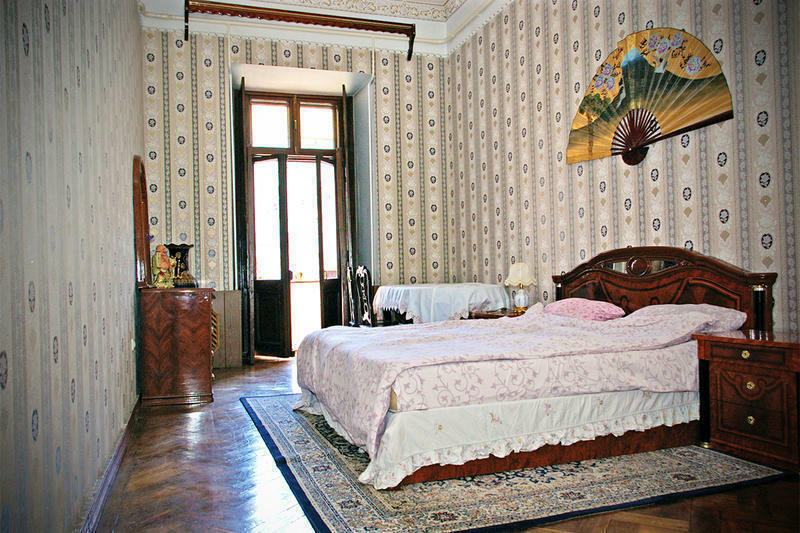 Our hostel is a large spacious apartment with chandeliers and gold gilded ceilings, styled after the palace of an 18th century Odessa aristocrat. We have two restrooms and a large comfy communal area with couches and a TV. The dorm rooms are beautiful and spacious. Our private rooms are luxurious and decorated with classic furniture. 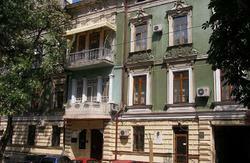 We opened, live and work in this hostel because we love Odessa and meeting new people. We enjoy the city, know the city and aren't here just to make a buck. If you want to stay in a place that feels like a home, is connected to the culture of Odessa and isn't just another generic hostel or apartment that treats you as a commodity, come stay with us. And because we want to have time to get to know you, we offer discounts for our long term guests. But, If you are in Ukraine looking for a wife through an agency please find other accommodations. (3 UAH for .22 bullet; 5 UAH per .38 bullet; 10 UAH for 9mm; 10 UAH for AK47 or M16; 15 UAH per shot with a scoped rifle). Private Banya (min 3- max 12): 150 UAH per person per hour. Price includes traditional drinks (Kvass, Kompot, birch juice), birch branches and beatings with the birch branches. Public Banya (min 2 people): 50 UAH per person per hour. !!! !Please note!!!! : in accordance with Ukrainian Law we are allowed only to accept payment in Ukrainian Grivens, so please be advised that the price of a stay in the hostel is the listed price in Grivens on Hostelworld. The Entrance is a Red/Pink wooden door on MALAYA ARNAUTSKAYA (Малая Арнаутская) building #60. Press the top buzzer (written next to it is Babushka Grand) to be let in. There is NO entrance on Ekaterinenskaya. In order to reach the destination, you need to follow one of these instructions. Please note that we can arrange to meet groups at the train station, just let us know when you will be arriving by calling +380 630705535. 1) Walk straight from the main entrance of train station across the plaza (past McDonalds) to Pushkinskaya St (Пушкінська). 2) Continue one block down Pushkinskaya St. to Malaya Arnautskaya St. (Мала Арнаутська). 3) Turn left on Malaya Arnautskaya St. (Мала Арнаутська) and walk for two blocks. 4) You will pass the BLACK SEA HOTEL on the right and cross Rishelevskaya (Рішельєвська). 6) You will see a red wooden door on the right hand side with a golden 60 on it, press the top buzzer marked 'Babushka Grand' and we'll let you in. There is some construction of the facade a little beyond our door, so if you reach that you have gone to far. Take the tram #5 to the train station or Prevoz (which is right next to the train station) and follow the directions above. Take Marshrutka (Bus) #117 to the corner of Ekaterinenskay and Malaya Arnautskaya. If you miss the stop you can get off just down the street at the Privoz Market (Fox Mart is the big store on the corner) simply walk back down Ekaterinenskaya, the street you were just on, to Malaya Arnautskaya and follow the directions above. We charge 15 euros for airport pickups. You can get a taxi from the airport. The price should not be more than 50 UAH. Please note that we can arrange to meet you at the train station, just let us know when you will be arriving. 4) Continue onto Мельницкая ул./Мельницька вул. 5) Turn left at Степова вул./Степовая ул. 6) Take the 1st right onto Богдана Хмельницького вул./Хмельницкого Богдана ул. 7) Turn right at Малая Арнаутська вул./Малая Арнаутская ул. 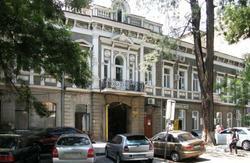 and go down the street until you reach Ekaterinenskaya #60, it will be on the left side.